You'd be forgiven for missing the debut of the updated 2018 Maserati Ghibli at this year's Frankfurt Motor Show. Italian automaker Maserati has been largely overshadowed by some of the major reveals at Frankfurt. 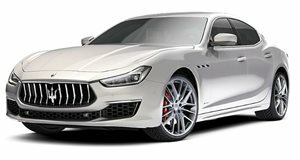 While its current offerings like the Levante, Quattroporte, GranTurismo and GranTurismo Convertible are all being flaunted at the show to vie for your attention, you may well have missed the debut of the new updated Ghibli sports sedan for 2018, which has gained some extra performance muscle for Frankfurt along with a restyled exterior and new advanced driver assists. New front and rear bumpers have improved the car’s aerodynamic efficiency by seven percent, reducing the drag coefficient to 0.29 from 0.31. Elsewhere, the updated Ghibli is the first Maserati to be fitted with adaptive full LED headlights with glare free Matrix high-beam. For the 2018 model year, the Maserati Ghibli will be offered in two distinctive flavors, comprising of GranLusso and GranSport trims. Of the two trims, the Ghibli GranLusso focuses on luxury, with an enhanced exterior finished and a luxurious interior with Ermenegildo Silk upholstery, while the GranSport is more performance-oriented as the name suggests, featuring a sportier exterior and interior. Both trims offer the same range of powertrains. The range-topping Ghibli S and SQ4 variants now produce 424-hp and 428 lb-ft of torque, representing an increase of 20-hp and 22 lb-ft of torque compared to the outgoing model. Thanks to this increased power output, the new Ghibli S needs 4.9 seconds to accelerate from 0-62 mph, while the all-wheel drive Ghibli S Q4 can do the same sprint in 4.7 seconds. Top speed sits at 178 mph for both models. For the first time in a Maserati, the new Ghibli features electric power steering that improves the handling and comfort, and has also adopted a new Integrated Vehicle Control traction system for improved driving dynamics and performance. A new range of advanced driver assists are also now available as optional extras, Highway Assist, Lane Keeping Assist, Active Blind Spot Assist, and Traffic Sign Recognition in addition to existing safety tech. No pricing details have been revealed for the 2018 Maserati Ghilbli in the US, but expect a slight increase over the current model which starts at $72,850.